Representatives from CARE Plus and CMAA with award on May 25, 2017. 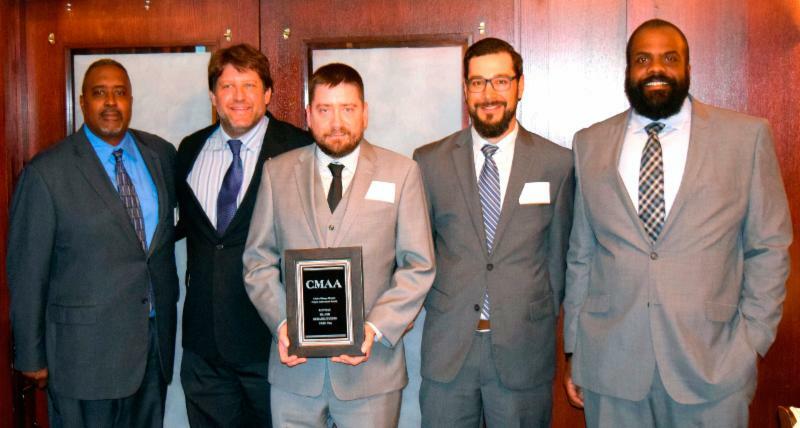 From L to R: Kevin Wilson, Vice President- CMAA; Justin Planasch, PE, CCM – CIP Civil Construction Manager – CARE Plus/HNTB; Frank Friar – CIP Resident Engineer – CARE Plus/ RM Chin; Marques Browder – CIP Field Inspector – CARE Plus/HNTB; Dan Pagano – CIP Assistant Resident Engineer – CARE Plus/HNTB. CHICAGO, 2017-May-29 — /Travel PR News/ — The Chicago Department of Aviation (CDA) is pleased to announce that the construction management team for the Runway 10L-28R renovation project at O’Hare International Airport is a recipient of a “Project Achievement Award” from the Construction Management Association of America (CMAA) Chicago Chapter. The award was presented to the CDA’s Owner’s Representative for the Capital Improvement Program (CIP), CARE Plus, at an awards luncheon on May 25, 2017. The runway project was selected as the top project for Program Management among a number of submissions from firms in the Chicago area. Runway 10L-28R on O’Hare’s south airfield was renovated in 2016. The project entailed mill and overlay of the existing 9,200-linear-foot asphalt section of the runway and adjacent connector taxiways, re-profiling the pavement where Runway 10L-28R intersects with Runway 15-33, replacement of lighting and installation of in-pavement runway guard lights, pavement grooving and marking, and the removal an existing taxiway. This entry was posted in Airports, Travel, Travel Awards, Travel Management and tagged "Project Achievement Award", Chicago Department of Aviation, CMAA Chicago Chapter, Construction Management Association of America, O'Hare International Airport, Runway project. Bookmark the permalink.